[Jan 2, 1945] Tues. Morning Mr. Elder, Thought I'd drop you a note to tell you of my change of address and also to tell you how much I enjoy getting the Scuttlebutt. I've moved to my last training post and we're to start flying B-25's. They seem to be a beautiful ship - I've been flying PT-17's BT-13A's and last AT-6's. I love this flying and surely hope on getting my wings. We're to graduate in March. I was just home to see all the snow - then returned here to go around in shirt sleeves and light jackets. Well - I'd like to wish you and your staff a very Happy New Year. This is my address. A/C Wm P. Harvey 37677389 A.A.F. Advanced Pilot School Sec.H. Class 45-A BKs. 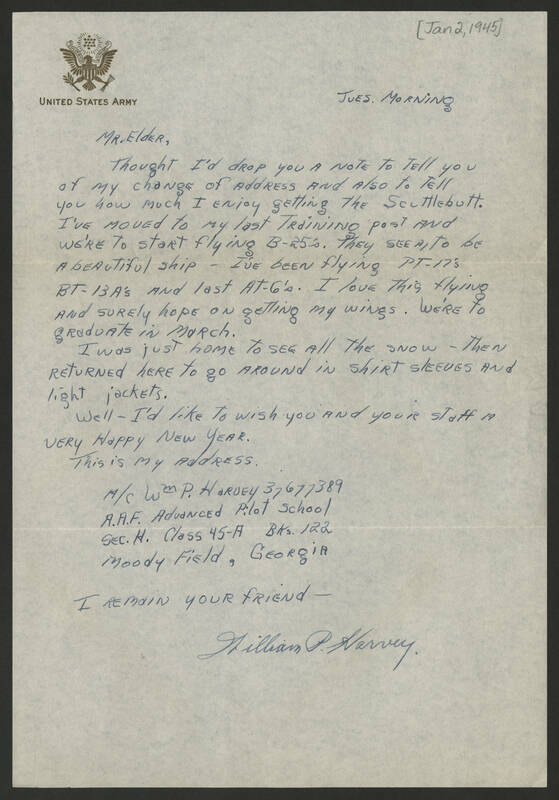 122 Moody Field, Georgia I remain your friend - William P. Harvey.